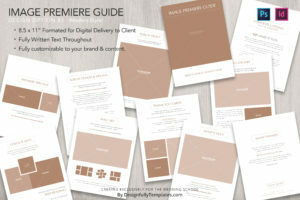 The Image Premiere Guide is a brilliant way to guide wedding clients through the delivery of their wedding images. You will receive InDesign and Photoshop templates, so that you can customize your own Image Premiere Guide in the way that works best for you! You can have them printed, or you can simply process them as PDF’s that you email directly to your clients. So you’ve shot the wedding, processed the images, and now you’re ready to deliver a gorgeous wedding gallery to your excited clients. For years, I’ve watched wedding photographers try to figure out the best way to deliver their images to their clients. 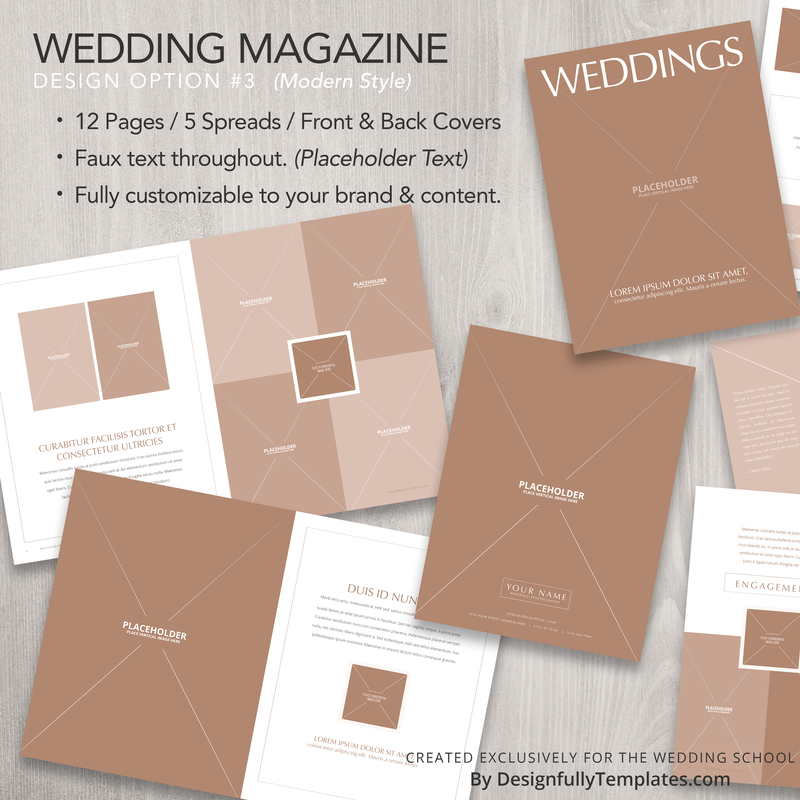 This brand new Image Premiere Guide from The Wedding School is here to help make that part of your job even easier! Created by brilliant wedding photographers Emily and Steve Pogozelski of Pogo Photo, the Image Premiere guide is the best way I have ever found to deliver that amazing experience of receiving your wedding day photographs from your wedding photographer. What is the Image Premiere Guide? 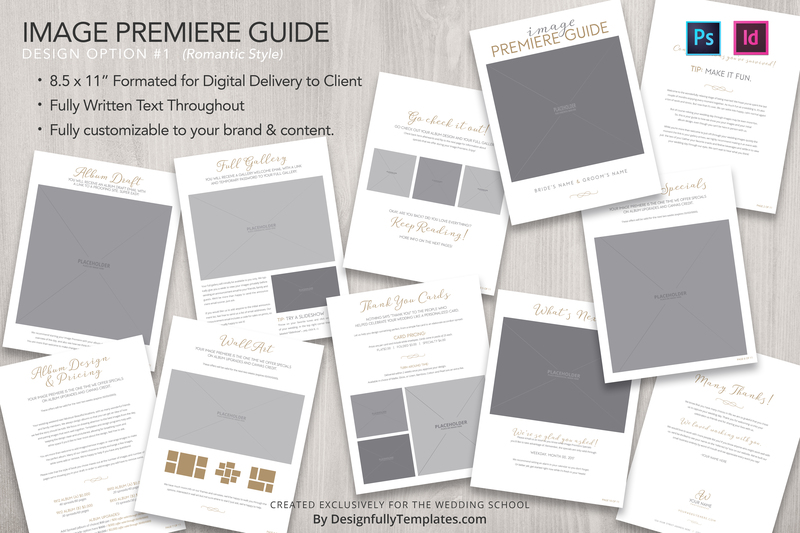 Simply put, the Image Premiere Guide is a brilliant way to guide wedding clients through the delivery of their wedding images. What is the hardest part of putting together any client communication? Writing the copy! 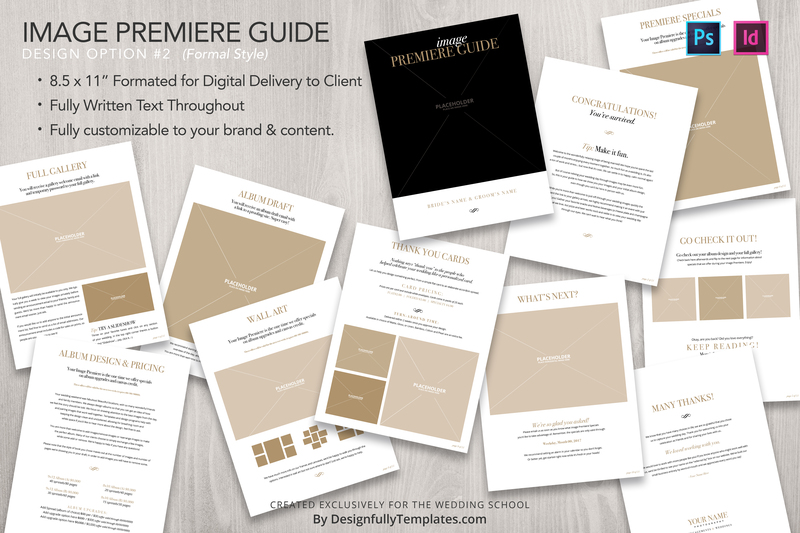 This Image Premiere Guide template comes with all the text you’ll need to drop in images for each individual client, tweak the pages to suit your products and prices, and off you go! 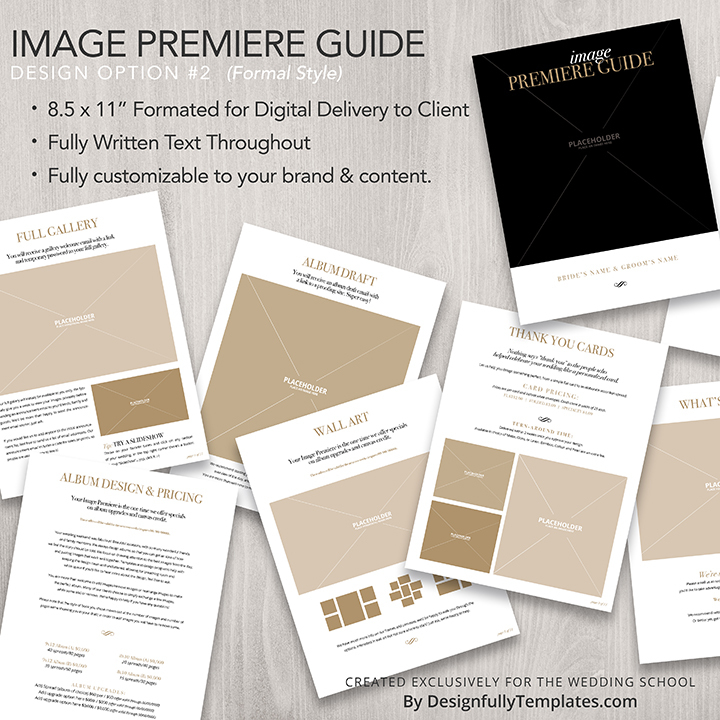 You’ll be ready to start delivering custom Image Premiere Guides to your clients within minutes. A custom welcome page. Choose between three distinctly different design styles to best fit your particular brand. Choose one client image to add to this page, and you’ve got a custom opening page for each individual client! A custom opening page. Use the already-written text included, or personalize the opening of this Image Premiere Guide with your own welcome! The album draft. Add another custom image, and you’re set! Whether you pre-design albums for clients or wait for them to get the party started, this page introduces clients to what they can expect with the album design process. The full gallery. This page, and the page following, are also completely customizable with client images, explains how to use, view, and navigate their online image gallery. Use our already pre-written text, or include your own custom note about what they can expect when they get the link to view their online gallery of wedding images. Premiere specials. Many wedding photographers opt to offer clients some type of sales or specials when their gallery is live. This page will introduce clients to the specials you offer, as well as set an expiration date for when those specials expire! Album design and pricing. One of my favorite pages, this is where you really get into the nitty gritty of the albums! Already pre-written for you with text about how the album design process works, you can use what we’ve got or add your own custom text! You can list out what your albums cost, what the upgrade specials are, and more. Wall art. One of my favorite parts of the Image Premiere Guide, this wall art page comes with pre-filled popular configurations of frames and prints. Drop in a placeholder image from that client’s wedding, and you’re all set to sell wall art to your wedding clients! Thank you cards. One of our most popular post-wedding sales, who doesn’t need some great thank you cards?? 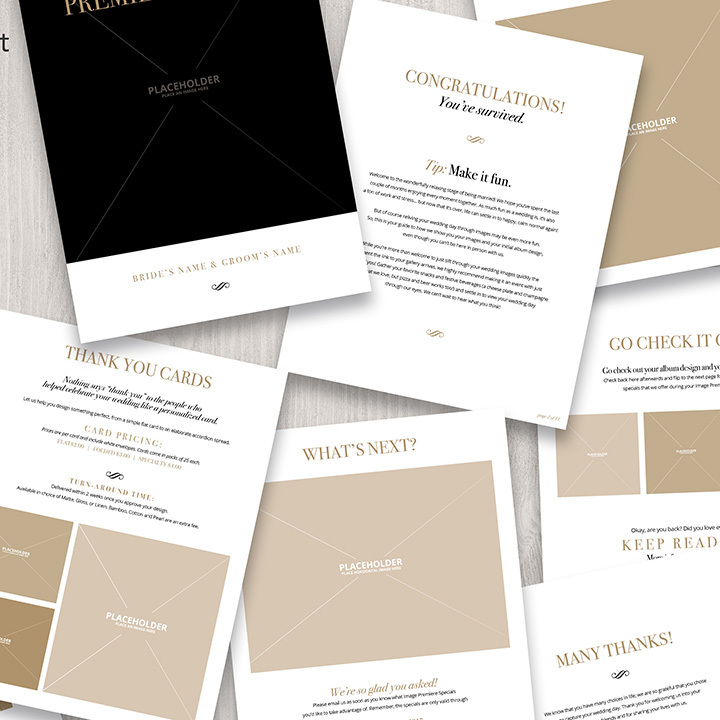 This page will help you sell thank you cards to your wedding clients with ease. Customize the page with images from their own wedding, and set your pricing – and you’re done! What’s next…and a thanks! The final two fully customizable pages let your clients know the next steps, and then thanks them for their business. Drop in your logo, write a custom note, and you’ll be ready to use this template every time you deliver images to wedding clients!